Recently, we had the pleasure of visiting the home of Elizabeth Krial, owner of Elizabeth Krial Design. 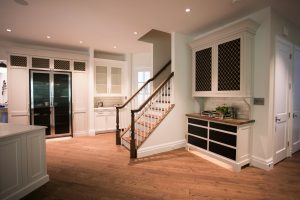 She gracefully opened up her exquisite home and spoke to us about the design Inspirations of her recently remodeled Northern Virginia home and office. Her choices? Our ultra matte, European inspired ‘Saddle’ and our ultra-modern, sophisticated ‘Linen’ white oak flooring. “This project was a very special one because it was a renovation of my own home. Over the years, I have created beautiful spaces for clients, but have never had the luxury of time to do it for myself. We have been in the same house for 20 years and after raising a family here, the house needed some new life. We focused on the main level for our first phase of renovation. 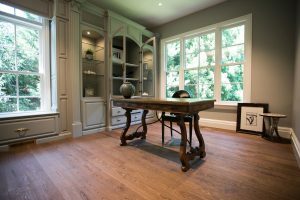 For the main level hardwood floors, I sought a mellow and tranquil vibe. 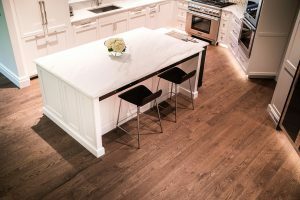 I sourced hardwood floor samples from Georgia, California, Richmond, and the U.K. But amidst all those samples, I wasn’t seeing my vision. Then, I recalled one of my finish carpenters having mentioned Cochran’s Lumber. I decided to take a drive out to Berryville, VA to check it out in the hopes of ending my exhausting search. When I entered the Cochran’s showroom foyer I was astounded by the array of choices and how beautifully the samples were displayed. I chose an oiled finish, wide plank white oak that is more traditionally used in Europe. Cochran’s ‘Saddle’ flooring gave me the soothing, mellow feeling that I was searching for. I was certain it was the right choice for my project and that it would balance my finer kitchen finishes just perfectly. Another part of this project included building a new design studio for me— hooray! More than anything, I wanted the studio to feel like it was in the clouds. My desire was for a modern, zen-like area that encouraged creativity and peace. 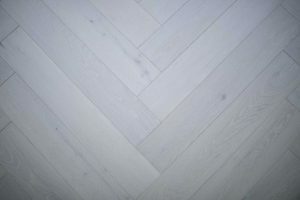 I designed the space with a classic herringbone floor pattern using 6” x 36” white oak planks in soft off-white ‘Linen’ finish. This classic pattern lent some tradition to the light colored floor and the large-scale anchors the space in fantastic proportion. When you open the doors to my studio, it’s like stepping into another world and I love it!